As strong storms moved through East Tennessee trees were brought down an intermittent power outages were reported. The City of Oak Ridge reported numerous outages because of downed trees. 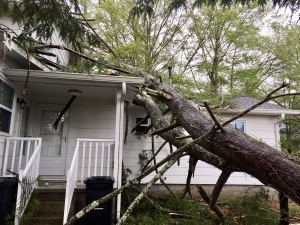 A roof on a building on Warehouse Road was partially blown off and multiple trees were reported down on buildings, homes, and across roadways. One woman was injured after a tree fell on her home on Nesper Road. City Officials are warning residents this morning that there could still be some traffic lights out as they work on restoring power to the entire city.